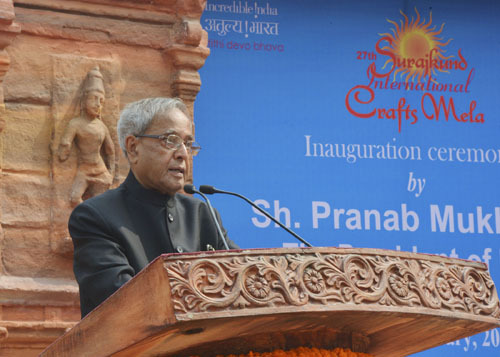 It gives me immense pleasure to be here for the opening of the 27th Surajkund International Crafts Mela. This event has become an important date in the tourism and cultural calendar of India – and that of well informed tourists all over the world. I recall that in 1987, the Mela was first hosted at a very modest scale - on a small ground of about 3 acres. I am indeed happy to see that it has evolved into an international event now – spread over 40 acres with the participation of crafts persons and weavers from all States of India and as many as 20 participant countries. I am happy to learn that as per previous attendance, more than a million domestic and foreign visitors are expected to visit the Mela during the next fortnight. This will be yet another occasion to showcase India’s treasured diversity – its finest handlooms, handicrafts, fragrances and flavourful cuisine. The participation of our friends from a number of countries with whom we have civilisational ties is a symbol of its success. The mela has been instrumental, in its own way, in building cultural linkages between communities of craftsmen and artisans in India and abroad. This congregation of more than 800 artistes and artisans from the widest range of the folk art and traditions of India affords an excellent opportunity to them display and popularise their products. It is an occasion for visitors to enrich their knowledge and understanding of this aspect of the cultural heritage our country, its art and handicrafts exhibited here. School children and tourists will have the opportunity to enjoy the vibrant rural ambience and directly interact with these gifted people. Thanks to the commitment and dedication of these craftsmen to the preservation of several ancient art forms, several unique traditions are being saved from extinction. Our handicrafts and traditional arts represent our Indian way of life. The range of our nation’s creativity is as diverse as its colourful people and their crafts. It is an embodiment of our aesthetics and our skilled craftsmanship. Our handicrafts and traditional arts are a highly decentralised activity, inspired by the local milieu and, in every case, based on local traditions, using local material and resources. These art forms have sustained generations, providing sustainable livelihood and socio-economic development at the grassroots. The Indian handicrafts industry has, over the years, contributed significantly to our nation’s foreign exchange earnings. During the last decade, each state has seen overall progress in this sector. However, despite, the large production base, India’s share in the world handicraft export market is still less than 2%. I am aware that the handicraft sector in India faces a number of threats and challenges which hamper its growth. There is a high level of decentralisation, a lack of access to credit, dependence on external factors including middlemen, inadequate raw material input, inadequate infrastructure and out-dated technology, limited access to markets and the biggest challenge is presented by machine-made products which are cheaper imitations but can be mass produced with high economies of scale. The export of handicrafts, in addition, has also had to face a slowdown after the 2008 economic crisis. Yet, we have many good reasons to focus on this sector, stimulate it and give it a boost. There are a number of favourable factors of which we can take advantage – we have an abundant availability of unique raw materials in India - such as bamboo, horn, jute, a pool of skilled artisans and indigenous knowledge, our production costs are generally low and this sector has always been a source of empowerment of women, youth and the disabled. Fortunately, due to the policy initiatives of Government of India and various state governments, there has been a growth of approximately 20% in the export of Indian handicrafts. A good sign is that many artisans who had left the sector have begun to revert. Governmental interventions to preserve the vitality of this sector have been effective in improving its prospects - through the development of capacity, skills, designs, infrastructure and merchandise. It is, however, necessary for Government to be vigilant and stay tuned to the demand in the existing markets in the developed countries as well as in emerging markets in Latin America, North America and Europe. It is equally important to address the declining investment in this sector and ensure institutional support - not only with better infrastructure but also supply of good quality raw material, facilitation of transport, access to credit and modern design and marketing mechanism. I am happy that the Government of Haryana, in collaboration with several Union Ministries has, year after year, has institutionalised this yearly event. This mela has become a sumptuous feast of colour, festivity, a manifestation of our nation’s spirit and pride in its wealth of artistic talent and skills. I congratulate Government of Haryana and particularly tourism department of Haryana for organizing this event. I would like to also compliment and congratulate the Government of Karnataka for displaying their distinctive cultural and archaeological heritage in such an aesthetic manner. I, personally, enjoyed seeing the replicas of the magnificent gates of the Mysore Palace and have always admired the unique architectural styles of Belur, Hampi, the Jain Basadis and Bijapur. Other State exhibits, Apna Ghar, and stalls of foreign participants including the SAARC countries and the African Pavilion will, no doubt, enthuse the visitors. I do hope that the success of this event will motivate other States of India to organise similar melas. I am sure that in the years to come the Surajkund Crafts Mela will continue to attract the best of our proud artisans. With these words, I wish the 27th Surajkund International Crafts Mela every success. It is my great pleasure to declare this mela open.